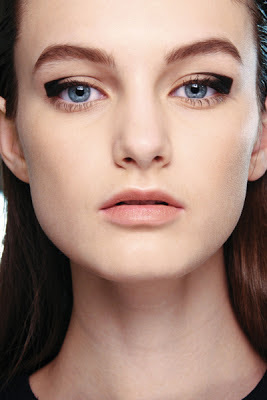 Every catwalk recently have been big on bold arty eyeliner. From gigantic cat eyes to more delicate patterns, it's everywhere. I love the way all the catwalk make up looks, but none of it is wearable. 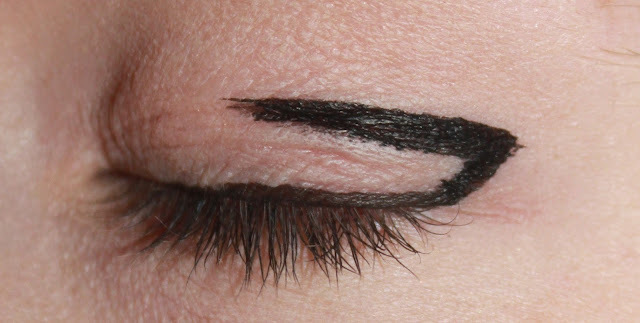 Today I'm going to show you how to recreate a 'Flying Eyeliner' look that's a little more wearable. The way I'm going to do it will be similar to the picture at the top of this post. First of all I prime my eyes and then pop on a foundation coloured shadow onto my lids, concentrating on the inner corners. This will give my lids a matte base for my eyeshadow. Before you read on, I have to tell you, I don't have the most steady hand and my eyeliner is pretty terrible. First thing I do is use my eyeliner, I used Rimmel Exaggerate Eyeliner. I first drew a flick on the corner of my eye aiming for the end of my eyebrow. 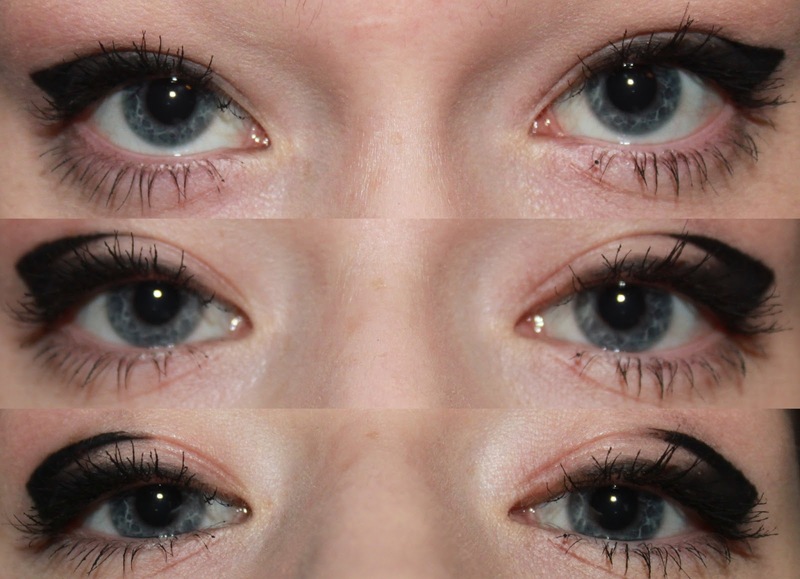 This makes sure that both eyes are symmetrical - Something I'm really bad at. It doesn't really matter how neat the line is on the inner of the shape, but on the outer shape you want it to be smooth. Then I take my liner, and from the top of the flick I follow along my crease and then finish above the middle of my eyelid. I then do the same to the top of my lashes then repeat on the other eye. I then go over the eyeliner with Blackout by Urban Decay, which is a matte dark black eyeshadow. You can use any black eyeshadow, but you'll get the best effects from a matte one. 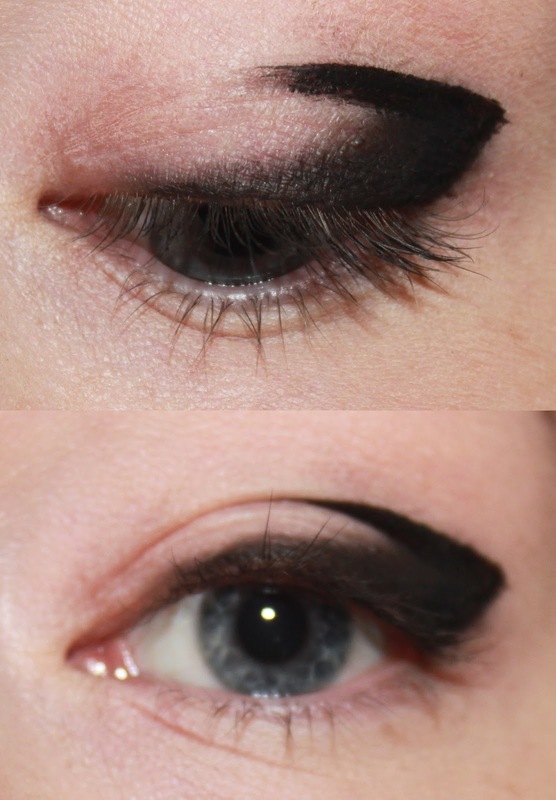 I then join the line on the crease and the line on the lashes with what looks like a slope. This creates a contrast between the sharp line on the crease and the smokey upper lashes. Then on the top crease line I used the eyeshadow again just to elongate the line and give a more gradient finish. This is pretty much it, and then I pop on some mascara and I'm away. I love how this looks. When I look up it looks like a really pretty cat eyed eyeliner, like the first set of eyes on the picture below, but when my eyes are looking forward, you get a more stand out look. This look isn't for everyone, and was only inspired by the catwalk trends. I wanted to create a trendy look that people were still able to wear. I really hope you enjoyed reading, and I hope you were inspired to try something new. Oh wow! This is so creative. I need to try this out too! I love this way to apply eyeliner.